Is your refrigerator ice maker making hollow ice cubes? Ice cubes sticking together? If you find that your Samsung, LG, Kenmore, Whirlpool, GE, KitchenAid, or Frigidaire ice maker is making hollow or small ice cubes, this can lead to major problems. At times when the ice maker ejects the ice cubes, the small ice ejectors may break the ice which can split the cubes in half. When this happens, the water in the partially frozen ice cubes can be flung around leaving drops of frozen water inside the freezer and on the ice maker itself. In extreme cases this can cause minor flooding. This is a semi common problem with ice makers and it is called “hollow cubes”. You will most likely first find that your ice cubes in the ice bucket are all stuck together. If the ice cubes are stuck in the dispenser and you can hear the ice dispenser running, the ice cubes are most likely stuck together. If you have small ice cubes, hollow ice cubes, or ice cubes that look like they were cut in half, you will want to troubleshoot this immediately to fix the problem so a larger more serious issue does not develop. FIRST… Be sure the water line to the refrigerator isn’t kinked or bent. A kinked or bent refrigerator water line will cause the water to flow slowly to the water inlet valve. Also be sure your fridge water filter is replaced every 6 months as a clogged fridge water filter can cause low water flow leading to hollow ice cubes. Hollow ice cubes can be caused by low water pressure. Low water pressure to the fridge will result in the ice maker filling too slow. This can make it so the ice cube mold does not have enough water in it when it begins to freeze the water to make the ice cubes. Check to be sure the water pressure to the fridge is between 35 to 120 psi or what your refrigerator manufacturer suggests is best. Another problem that can make your ice maker create hollow cubes is a bad thermostat. A bad thermostat will create hollow ice cubes as it causes it to cycle too soon. The ice maker thermostat is located inside the icemaker itself. You can check the thermostat with a meter. If you find that the thermostat is faulty, remove and replace it. If you find that the mold is not completely filled with water, you need to be sure your refrigerator is level. Put a level on top of the fridge and be sure it is level in accordance with your refrigerator owners manual. You could also have an ice maker that was installed wrong and the ice maker itself is not level. Both of these issues can cause the hollow ice problems. The water valve that is located on the wall or under the sink can lead to hollow ice cubes from the ice maker. Check this valve to be sure it is fully open and that the screen located inside the valve is not clogged. When the water turns on to fill your ice maker, it fills the end of the ice maker on the other side of the control and motor first. When the water will not fill ALL of the ice cube molds then the mold nearest to the controls and motor is usually partially filled. There is a thermostat that controls and senses the temp of the ice cube mold. This thermostat will close and the ice making cycle will begin. When the ice maker has one or more partially filled ice cubes in the mold, this makes the mold have some cubes completely frozen and others may be hollow with some water still inside of them. To see if this may be your issue, you can look into the mold after it has filled with water and see if the ice cube molds are all filled with the same amount of water. If you cannot see into the ice maker mold, put your finger or an object into the ice cube mold to measure how much water is in the molds. You will usually find one end of the ice cube mold is completely filled and the other side is partially filled if you are getting hollow cubes. You may need to adjust the water level for the icemaker. See your owner’s manual to change the icemaker water level. If the water level of the ice maker is correct, test the water inlet valve on the back of the fridge with a multimeter to be sure it is working properly and be sure it is not clogged or partially blocked. If the meter test does not check out or the inlet valve is clogged or blocked, remove and replace the water inlet valve. If all the above did not work to fix your problem, you may need to replace the complete ice maker or other parts that go to the icemaker. Ice makers can range from $40 to $200 US dollars. 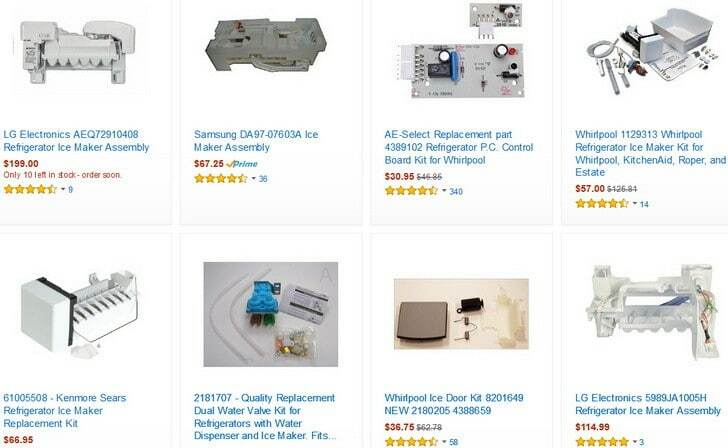 There are many different new and OEM ice makers and ice maker parts for your refrigerator freezer above. Do you have questions about why your ice maker is not producing full ice cubes, why there are frozen water drops in your freezer, or why the ice maker makes hollow ice cubes? Please leave your questions below and we will be happy to assist. My ice maker is producing – I believe – one round of cubes full and normal, then another round of cubes is hollow. The ice maker is about 6 months old. It was fine when it was installed and recently started with this full/hollow production. Still an intake or water line issue or something else? Water line looks fine – also relatively new. The ice cube maker is not filling up all the way. The last 2 slots are completely empty and the next 2 are only partially filled. Some of the cubes come out hollow or only partially formed and they seem more wet. Some come out very small. The rest are normal size. If you are getting hollow ice cubes or the ice cube tray is not filling up with water completely, make sure the refrigerator water filter is not clogged. Replace the water filter for the refrigerator/freezer. If the water filter is not the issue, be sure the water line and water inlet valve are not clogged or blocked. The ice maker itself may have the correct water pressure but the timer mechanism may be faulty. Troubleshoot further to find the cause. Previous post: New Dimmer Switch Has Aluminum Ground – Can I Attach To Copper Ground?